volume discount, regular delivery, accounts, choosing advice. Full online details soon call or email to discuss requirements. Standard commercial 1-4 groups. Full online details soon call or email to discuss requirements. Automatic, easy to use, self service. Jura Z5 One Touch to the ENA Non Commercial Range Click Here The domestic range can also be purchased with a commercial 1 year warranty call for details. Maintained, easy to use coin operation. Full online details soon call or email to discuss requirements. Full online details soon call or email to discuss requirements. sugars, hot chocolates, biscuits, chocolates, toppings, cups, stirrers, whiteners, teas, cleaning. Full online details soon call or email to discuss requirements. machine leasing, servicing, renting. Full online details soon call or email to discuss requirements. THIS MODEL HAS BEEN UPDATED TO THE NEWER JURA XS90 ONE TOUCH - The Information on this page may still be usefull, but for prices and current specs click here. in the box - any problems call 0870 207 4831 or email. The XS90 is a revision of the old X90, this model is an excellent machine, the main points to note when comparing is that the XS90 are that it can be plumbed in with the standard plumbing kit, however it cant do one touch cappuccino, it has one touch coffee and automatic milk frothing but note in a single process. But an advantage to that is that the cup usuage is increased to 75 cups as the machine isnt working as hard as the X5 which only has a 50 cups per day usage. The XS90 is as the XF70 taken from the top of the range domestic model, this has a larger water tank and larger waste coffee compartment for higher usage. On this XS90 we are now including the extra bean hopper extension free. This machine is excellent in that it has twin boilers so no delay between coffee and steam for milk, it also has a more commercial look which is important to some businesses where customers expect to see a certain looking machine. Plumbing Option - This model can be plumbed into the mains water supply, not essential on a machine this size as it wont be doing high voumes where refilling is time wasteing but is a requirement for some and this gives it to you in a low price point. No One Touch Cappuccino/Latte - Coffee & Milk Prepared Seperatley, Still has automatic milk frothing but must be despenced separatley to coffee. Twin Boiler - No delay when switching to and from coffee despensing and milk frothing, no delay on Z5/X5, X7 or X9, the only model in the range that doesnt have a twin boiler is the XF70. A touch of a button is all it takes to make one of the seven individually programmable coffee specialities that can be prepared with the IMPRESSA XS90. Use the professional cappuccino frother to take the hard work out of making special favourites like Cappuccino or Latte Macchiato. The height of the coffee dispenser is highly adjustable, which means you can use virtually any size of cup of glass, and the machine has two separate integrated heating systems to facilitate seamless, instantaneous switching from hot water to steam production. The powder dispenser holds a second, pre-ground coffee blend to give you even more possibilities. The Jura Impressa commercial range of bean to cup coffee systems are characterised both by there advanced technology and its user-friendly operation. This machine is sophisticated and simple to use, requiring no mains water if not available so the machine can be setup anywhere, no technician or training is needed. The instructions are simple and easy to follow, the results are amazing, your own swiss engineered robotic barista. Suitable Use: office, bar, restaurant, hairdressers, conferences & seminars, car showroom, meeting rooms, receptions and there is no reason why you cant have it in your home!. Note: This machine is not suitable for coffee shops, it is not intended nor would the warranty cover it for constant heavy commercial use every day, if you require a machine for over 75 cups we would recommend the Jura X7 or X9 models. All the machines can be used to whatever level you wish and there is no reason why they would not handle it but if a fault occurred the warranty may be invalid which would mean the repair would be chargeable, the machines log the number of cups produced. Less is not necessarily always more. And that's why the IMPRESSA XS90 comes with a 5.7-litre water tank, a container for up to 280g of coffee beans and a grounds container for up to 40 portions.This makes it ideal for situations where a daily capacity of 75 cups is required. Three different coffee varieties are available at the push of a button. The coffee strength, water volume and temperature can be set individually for each server key to suit your personal preferences. The variable brewing chamber takes between 5 and 16 grams of coffee. Two cups can be made in a single brewing operation. Two separate heating systems ensure that hot water and steam are available at any time. The steam supply goes on to stand-by and is ready to produce again in seconds. With the E.S.M.© (Energy Save Mode©), the machine's energy-saving potential can be adjusted entirely to your habits. And, if necessary, the machine can be disconnected completely from the power supply. The process of making a top-quality cup of coffee starts with the grinding of the fresh coffee beans, and the important thing here is to obtain an optimum blend of small and large grains.This is guaranteed by the six-setting precision grinder, which is now even quieter thanks to the contribution of a team of acousticians. And an active bean level monitoring system ensures that the grinder will never run empty. So it's goodbye once and for all to cups that are only halffull. Integrated rinsing and cleaning programmes guarantee your machine a long and active life. The display dialogue system has clearly legible red symbols that indicate when one of the maintenance programmes needs to be activated. The machine then takes you through the necessary operating and programming steps in a choice of seven languages. Less frequently used programming buttons are discreetly concealed behind a flap. The X90 features the same Auto Cappuccino system where the machine draws milk via a tube out of the milk carton and froths it directly into the cup, no waste, no mess, consistent quick froth and steamed milk, ready anytime. Perfect milk foam for the ultimate Cappuccino experience is guaranteed. The mouth-watering prospect of a perfect coffee running out of the solid, chrome-plated dispensers and into the cup, where it forms a delicious, frothy crema and releases all its enticing aromas, is one that appeals to all the senses. And because enjoyment begins with the eye, the integrated cup illumination puts every single coffee in the perfect light. Integrated rinsing, cleaning and descaling programmes are available at the touch of a button, and notification appears automatically on the display whenever one of the care programmes needs activating. If you prefer, however, you can manually select and start the required programmes in the maintenance menu. The height can slide between 79mm and 142 mm. This permits adjustment to different cup heights to a glass for Irish coffee. The crema is preserved and no coffee splashes onto the appliance. The Impressa XS90 offers three different integrated cleaning programs: a coffee sector cleaning, auto cappuccino cleaning and combined cleaning programs. Also de-scaling programs. All Jura machines incorporate the CLARIS water filter system in the water tanks. The CLARIS filter cartridge protects your machine and increases its life. The CLARIS system filters the causes of limescale and other substances. Water with a high lime content can damage your coffee machine, lime deposits in the heating cartridge or the thermo-block and clogs the water pipes. The water is filtered to leave a much more pure water which will also improve the taste, a coffee is only as good as the water it is made with. 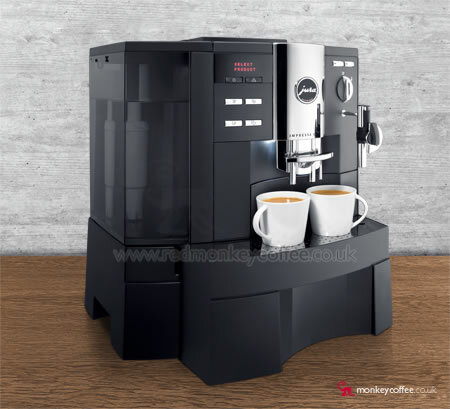 Red Monkey Coffee has broken it down for you so you can see exactly what extra you get on each model & what is the standard, remember its also the look, design and style of the machine which is one of the biggest differences. The XS90's Features, both the X7 & X9 have higher specs/better features. • Can optionaly be PLUMBED INTO MAINS, requires separate plumbing kit. 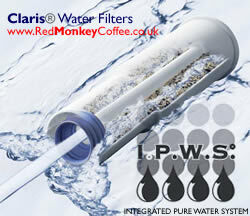 • I.P.W.S.© (CLARIS water filter cartridge system) Filters the water to purify and remove the causes of lime scale and makes the coffee taste better as the water is purified.  Auto-Cappuccino - Frothed & Steamed milk dispensed into cup direct from milk container, no jugs.  Integrated cleaning, de-scaling & rinsing programmes, no need for outside maintenance.  Programmable powder quantity, brewing temperature, on-off time, water hardness. Setup: This can be plumbed in to the mains using the extra mains plumbing kit. It alternatively requires no plumbing, wiring, waste, regular outside servicing or training the machine is self maintaining with cleaning & decalcifying cycles performed by yourself with tablets, the machine will tell you when these need to be carried out. Cappuccino: Times for cappuccino, latte etc are dependant on how long you take to dispence/froth your milk, this is automatic without moving your cup on the X7 & X9. Email for installation requirements sheet. email or call us on 0870 207 4831 for advice & ordering. Jura X90 and X95 are no longer available. Call 0870 207 4831 or email mail@redmonkeycoffee.com to discuss your requirements.